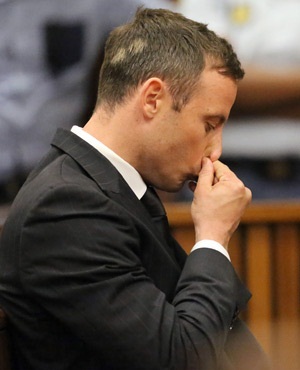 Judge Thokozile Masipa handed down a sentence of five years in prison for Oscar Pistorius's culpable homicide charge. Watch Masipa hand down her ruling here. Johannesburg - Oscar Pistorius will stay in jail after a decision to grant him parole was again delayed on Monday, his lawyer told AFP, in a long battle over whether he should be released early from a prison sentence for killing his girlfriend. The parole review board met on Monday to determine if the Paralympian should be allowed out on house arrest. "They're going to refer the matter back to the [original] parole board," Brian Webber, a lawyer representing Pistorius, told AFP after the review board meeting. Pistorius was sentenced last year to five years in prison for killing Reeva Steenkamp on Valentine's Day 2013, the culmination of a trial that attracted global headlines. He was found guilty of culpable homicide after saying during the trial that he shot his girlfriend through a locked bathroom door because he mistook her for an intruder. Pistorius was due to leave prison in August, but he was kept behind bars after Justice Minister Michael Masutha made a last-minute intervention blocking his release. Masutha said the parole board had made a mistake when they approved Pistorius for parole before he had served a sixth of his five-year sentence, as required by law. Reeva Steenkamp's parents, who are convinced Pistorius murdered their daughter in a rage, have strongly opposed the athlete's possible release, telling an Australian television channel in August he had ruined their lives. "He killed her. He admits he killed her. She's dead. Why didn't he just let her walk away? Why?" Reeva's mother June Steenkamp said in the interview. Even if he is freed from prison, Pistorius could find himself back behind bars for a minimum of 15 years if an appeal by prosecutors next month is successful. They are pursuing a murder conviction and a longer sentence, arguing that Pistorius deliberately killed Steenkamp after an argument.